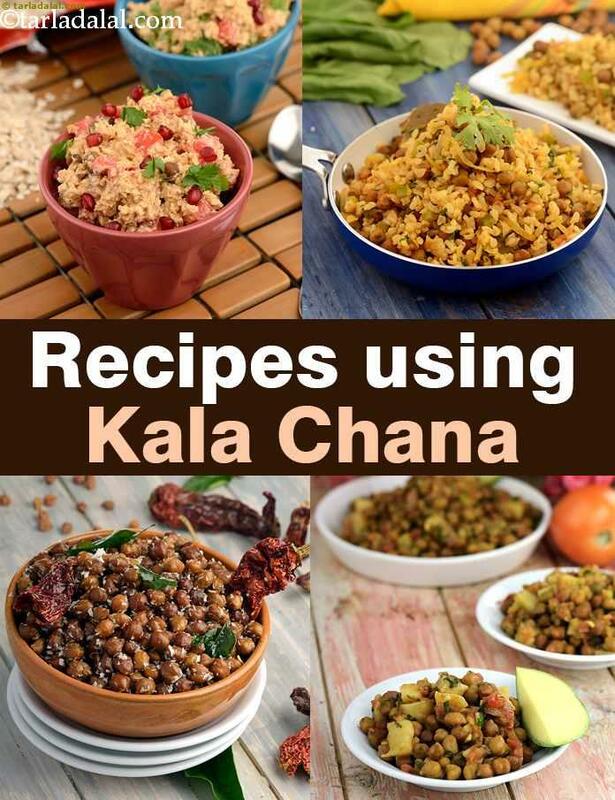 kala chana recipe collection. Kala Chana or Desi Chana is the tinier version of the regular yellow chick pea. It is darker, browner in color and is mostly cultivated in the Indian subcontinent along with Ethiopia and Mexico. It has a nuttiness to its taste and feels a bit starchy in texture when cooked. This chana can be used whole, mashed and even sprouted. To cook the chana, it first has to be thoroughly washed and then kept to be soaked overnight. When soaked overnight they grow in size and then are either boiled or pressure cooked till soft. This chana can be enjoyed just plain boiled, either hot or cold or be made into a chaat or subzi. Sprouted Chana is also healthier than just boiled chana as sprouting increases the vitamin C content! Kala Chana is an ingredient that is used in the Indian kitchen a lot whether in rice preparations or being added in subzis. Chana Spinach Rice is a beautiful medley of flavors that come together to make a perfect, fulfilling meal made with spinach, capsicums and tomatoes. Another rice dish that tastes superb with chana is Lajjatdar Handi Biryani. It is the perfect meal where every spoonful will make want more and more. Kala Chana gives a very homely feel to the dish and no matter where I am in the world, it takes me right back to the hot chana subzi that my mother used to make. Kala Chana Ambti is a finger licking subzi which has contrasting flavors of medium spiciness with mild sweetness which can be had with chapatis. Another homely dish is Chana Ghassi, a semi dry subzi with roasted spices and coconut coming through, perfect with rice! You can make a lot of snacks varying from chaats and tikkis with boiled kala chana. But one of my favorites is Damni Dhokla. Even though it takes a long to prepare this multi legume dhokla, it is completely worth the effort when you actually try it! If you want to go the classic route, there is always Chana Chaat! This street snack reminds me of my childhood when I ate this at the beach, I absolutely loved it! Chana with chaat masala, tomatoes, onions, spiciness of the chillies and sourness from the raw mangoes, it’s the ideal snack! Roasted Chana combined with a salted peanuts, coated in masalas and spices, makes Masala Peanuts and Chana and ideal snack for school going kids or anyone going through hunger pangs. Apart from this, one can snack on plain boiled chana as well, with just a hint of red chilli powder and salt to jazz it up or add it to a mixed kathol bhaji and eat that as an evening snack. There are so many different types of food that can be made with kala chana! Salads are one of the popular recipes that always require some or the other innovation. Oats Chaat is the perfect example of this. Oats is the last thing that one expects to see in a chaat but it is as tasty as it is surprising. Combined with nutty chana and sweet pomegranate, it will surely be a favorite in your house! One more unique preparation is Mixed Pulses with Vegetables wherein a mix of masoor, chana and moong with cauliflower, onions and tomatoes with a strong masala to bring it all together! Enjoy our kala chana recipes below. You will find Boiled Kala Chana article of interest also .